Jack Kirby Collector #66, Draw #31, and Comic Book Creator #10 all ship today! These issues will be in stores Wednesday, December 23, and are now shipping directly from TwoMorrows. 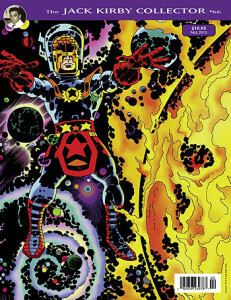 Think twice before skipping JACK KIRBY COLLECTOR #66, our special ?DOUBLE-TAKES?ISSUE! It features a wealth of oddities, coincidences, and reworkings by both Jack and?Stan Lee from throughout both their careers! There’s more on Kirby’s Galactus Origin that you never saw, a head-to-head of Ditko’s vs. Kirby’s Spider-Man, how Lee and Kirby viewed “writing” and “script” differently, plus a rare Kirby interview, MARK EVANIER and our other regular columnists, unseen and unused pencil art from FANTASTIC?FOUR, 2001, CAPTAIN?VICTORY, BRUCE LEE, and more! Preview and preorder at THIS LINK! DRAW! #31 (80 FULL-COLOR pages, $8.95), the professional “how-to” magazine on comics and animation, busts some new moves, Philadelphia Freedom style! 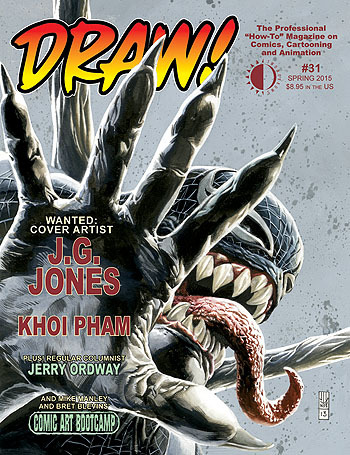 It features how-to’s and demos by Philly area artists JG Jones (52, Final Crisis, Wanted, Batman and Robin) and Khoi Pham (The Mighty Avengers, The Astonishing Spider-Man, The Mighty World of Marvel). Plus regular contributor Jamar Nicholas gives his reviews of art supplies, and we finish this jam-packed issue with Jerry Ordway (demonstrating the “ORD-way” or drawing) and Comic Art Bootcamp by Draw! editor Mike Manley (another local Philly resident) and Bret Blevins. Grab a side of cheese fries, and enjoy this artistic belly buster! Preview and preorder at THIS LINK! Comic Book Creator #10 give you a double-dose of amazing coverage as we feature a history of the short-lived but amazing Star Wars precursor, the Broadway science fiction epic WARP! Though the 1973 show lasted a mere two weeks on the Great White Way, the work of art director NEAL ADAMS is unforgettable and, after all, it spawned a 1980s series at First Comics! We interview Neal, director STUART (Reanimator) GORDON, playwright LENNY KLEINFELD, stage manager DAVID (Flying Frog) GORDON, as well as those participates in the First Comics series! On the flipside, CBC is proud to feature an exhaustive interview with PETER (Hate!) BAGGE, from his work on Comical Funnies to editor of Weirdo magazine to his solo series Neat Stuff to the chronicles of Buddy Bradley, and beyond! Preview and preorder at THIS LINK!